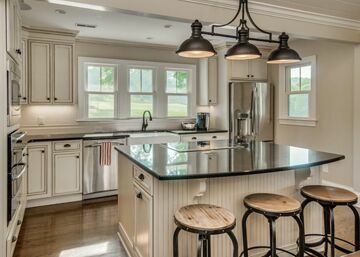 One of the most important parts of a successful kitchen remodel is also one of the most overlooked: Lighting. Task Lighting: You’ll want plenty of light for tasks like cutting, chopping, washing, etc. Choose lights that illuminate the surface you’re choosing and won’t have you standing in your own shadow. Consider directional lights and under-counter lights to make daily tasks easier. Ambient Lighting: These are the lights that set the tone and mood in your kitchen. Often, you’ll want to have these lights on a dimmer. They can be brighter when you’re preparing a meal or doing some other task and then they can be dimmed to a comfortable glow when you’re entertaining. Decorative Lighting: While these are similar to ambient lighting, the focus is more on the actual features themselves. Pendant lighting in the kitchen is a good example of that. But there are a wide variety of pendant fixtures. Select something that goes with the overall theme or style of your kitchen. We love what we do and love helping homeowners, like you, through the remodeling process. Have a project in mind? Don’t hesitate to reach out. We’re happy to answer any questions you have or discuss how the remodeling process works.